This letter was written by Carl Newcomer, a special assistant to the State Bank Commissioner, to Foulston, Siefkin, Fouston & Morris, Wichita, Kansas, apparently attorneys for the Le Velle Fan-Lite Corporation. The letter lists Le Velle Fan-Lite Corporation's stock certificate numbers, owners' names, and the number of stocks owned by each person that have been placed in escrow with the Bank Commissioner to fulfill Blue Sky law requirements. 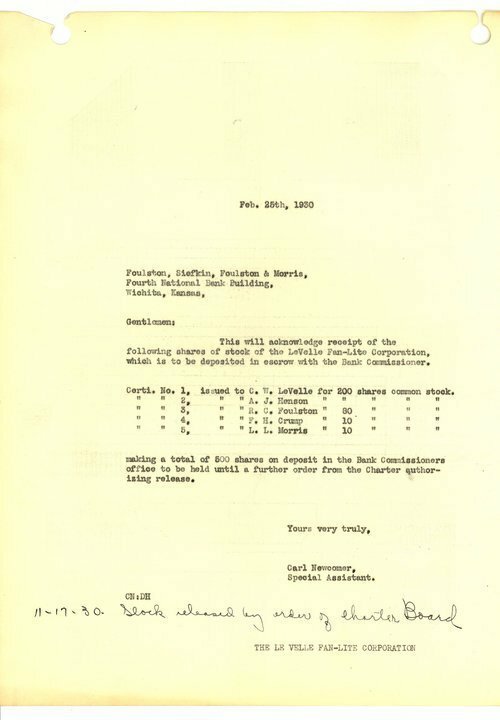 A note on the letter dated November 17, 1930, indicates the stocks were released by order of the Charter Board.